Flooding is New Zealand's most frequent natural hazard. It can have significant social, environmental, and economic implications when it is not managed well. I am interested in stormwater management because of its role in protecting New Zealanders and their homes from flooding. People need to know that their council is managing the risk of flooding appropriately. They should also be involved in decisions about how to reduce the risk of flooding, and by how much. According to the Insurance Council of New Zealand, severe weather and floods resulted in about $260 million worth of claims in 2017/18. Climate change and urbanisation are expected to increase the risk of flooding. We looked at how Dunedin City Council, Porirua City Council, and Thames-Coromandel District Council (the three councils) managed their stormwater systems to protect people and their property from the effects of flooding. To date, the three councils have had an incomplete understanding of the flood risk in their districts. Much of their assessment of flood risk has been based on information collected after a flood. This reactive approach risks councils focusing on reducing the effects of the most recent flood, rather than considering all possible flooding events and their effects. It also means that they cannot forecast accurately, and risk being poorly prepared for unanticipated events. The three councils have gaps in their understanding of the current state of their stormwater systems. These gaps limit their ability to make well-informed and deliberate decisions about how to manage those systems. This means that the councils are unlikely to have had informed conversations with their communities about the potential risk of flooding and the cost of reducing that risk. Councils are planning to continue spending less than depreciation on renewing stormwater assets, which might indicate that they are under-investing in maintaining those assets. If nothing changes, the under-investment will increase the risk of stormwater systems being unable to cope with rainfall that results in flooding. The three councils were already aware of some of the issues we identified and are planning improvements. These councils are at varying stages of making improvements. However, all three have more to do. Councils need thorough and reliable information about their stormwater systems and flood risks so they can make deliberate choices about what level of service they need to provide to their community now and in the future. Councils need to prioritise gathering the right information to help them understand their flood risk and the performance of their current stormwater system in reducing that risk. This would enable councils to identify the assets most important in protecting homes and property from the effects of flooding, and identify their investment priorities. In my view, the historical under-investment in stormwater systems that my Office has previously identified creates a level of urgency. People need to be confident that the stormwater system will continue to protect their homes and property from flooding. I am aware that many councils outsource the maintenance of their stormwater systems. All councils need to ensure that they effectively monitor and manage a contractor's performance so they can assess whether they are receiving what was contracted. There is also an opportunity for all councils to work together in new ways to address shared challenges in managing their stormwater systems. For example, councils could collaborate to improve their capability in asset management or in responding to climate change. Our main findings and recommendations are relevant to all councils. 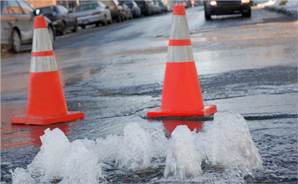 All councils face challenges when managing their stormwater systems, including ageing infrastructure, limited capacity, managing costs to the community, and having the right people and skills in their organisations. I would like all councils to use this report to identify where they can improve their management of their stormwater systems so they can ensure that their communities are protected from the risks of flooding. I thank the staff of the three councils for their support, co-operation, and openness throughout our review.